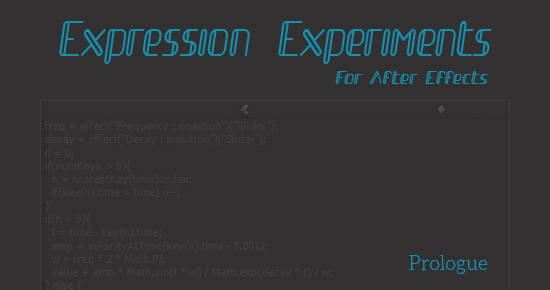 Welcome to my After Effects Expressions Sharing series. This is a series focused on sharing some Expressions with you, After Effects Artists. After Effects Expressions can improve our creativities with complex motions, and save our precious time by automating some actions. But there is only a few resources for Expressions on the web. Besides, most of those are basic. This is the reason why I decided to start. My goal for this series is to discuss the Expressions with you guys. I’m NOT expert coder. In fact, I prefer designing to coding. I’m afraid of Mathematics though I don’t dislike it. So I need your feedback. I want you to correct my errors if any. I want you to tell me if you know the better ways. So please don’t hesitate to leave a comment. This is not for beginners but it would be great if this series could help some mographers even just a little. OK. Before I begin this series, I will show you some helpful resources for Expressions. Because this is prologue to my new challenge. Check it out if you haven’t visited these links.